I have come to the conclusion that nearly everything in life is influenced by power. Yet we almost never evaluate for it. It is difficult to be powerless and happy. The type and extent of the power we want will differ from person to person, depending on our circumstances and vision for our lives. But we all need power of some kind to feel fulfilled. On the other hand, power is a concept that stretches far beyond the individual. Power issues are everywhere. This is certainly so for all interventions (by these I mean projects, programmes, strategies, policies, institutions and so on, from local to global levels) aimed at contributing to development in some or other way. We are most used to visible power, but in my experience invisible and hidden power truly shapes the world. For some unfathomable reason we do not address this important issue explicitly when we design, execute and evaluate interventions. We focus on power when we deal with so-called empowerment programmes. But this is only one specific context in which power analyses are useful. We do not analyse or highlight the impact of power on development, or on evaluation for that matter. And when we do so, we are too timid in our discourse. Perhaps power is an “inconvenient truth”, one too difficult to take head-on – ironically, perhaps because of power asymmetries. This situation has to change. Evaluators and evaluation commissioners have to engage with power – or acknowledge the power that lies in ignoring this issue. Not having aspects of power as an explicit focus in evaluation Terms of Reference is no excuse for ignoring them. I do not believe that evaluations are good or useful unless they analyse the main influences on success, slow progress or failure. Power dynamics, power relations and power asymmetries have to be some of the issues studied in this context. And please, let us not think only about the influence of power on individuals or on “communities”. It is important to think about power in relation to individuals, groups, organisational structures, institutions, countries and regions. Nowhere is this need more acute and important than in poverty-stricken countries in the Global South. Power is complicated and multi-dimensional. There are many ways in which it can be conceptualised, and in which power analysis (and I don’t mean statistical power analysis) can be done. See for example here, here and here. A forward-looking summary and list of useful examples can be found here. An analyses I have used frequently when working with power at individual level has been derived from a conceptualisation of power introduced by Jo Rowlands in 1997 – power ‘from within’, power ‘to do’, power ‘over’ and power ‘with’. 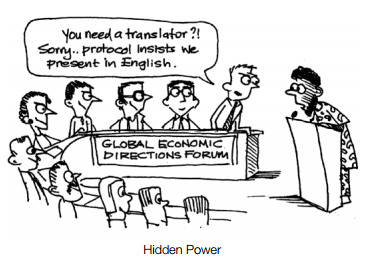 The following cartoons by Irene Guijt on Powercube give a sense of their meaning, and I will provide an example of their application in an upcoming post. Finally, for those evaluators and commissioners of evaluation who need to be convinced, I recommend the following relevant books for (yes, we should read – a lot). They all address power, but from different vantage points. They are well worth the effort. This section on power analysis as relates to evaluation is very informative. It points to areas that those of us engaged in development evaluation often overlook. Your overview of reflections on different dimensions of power is quite useful. It also reminds me of Naila Kabeer’s (1999; 2001) views on power and how they affect social and gender relations. Perhaps another area to look at as relates power and evaluation is ‘cultural norms, values and prescriptions’, as a source of invisible power, that often bears heavily on the success of development processes. For example just today I learnt of a project at the Kenyan Coast where a newly built borehole through the support of an international funding organization, the only source of clean household water within a radius of over 20 km, could not be used by the community because certain traditional rights had not been performed. This is despite the water having been certified suitable for drinking the government and other institutions. Thanks Prof. Ofir for this. Wanjiku, your comments and example are very pertinent. I am sure that many aspects of “power” played a role in your example. Thanks for sharing this – a good example of the need to recognise that both culture and power play a major role in development success.